Music agreement contracts are usually long and tedious processes that are quite necessary in the age where each party needs to protect their interests. Depending on the artist and the recording company involved, the agreement contract ensures both parties benefit from the proceeds of the music and that all rights are exclusively owned by the parties involved. Our Sample Agreements for music contracts present different contracts pooled from different sources that are all available free for downloading. 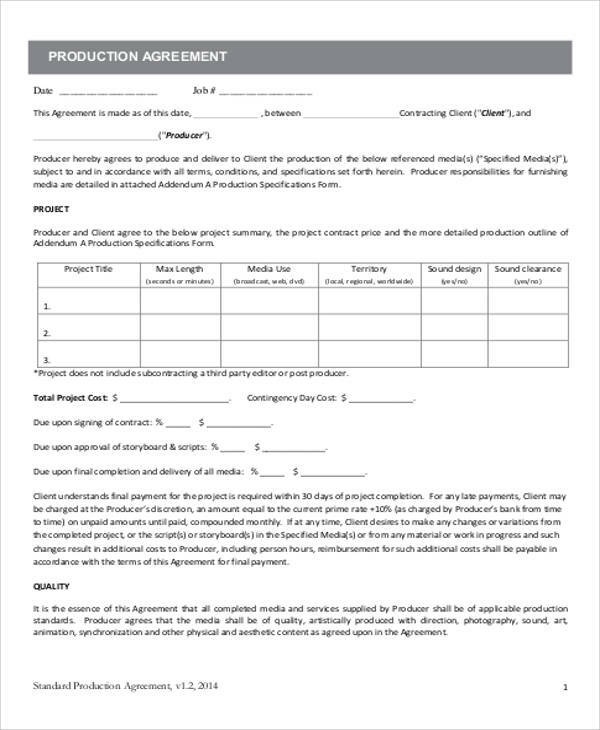 These samples serve as guide for users who need to draft their own music agreement contracts. 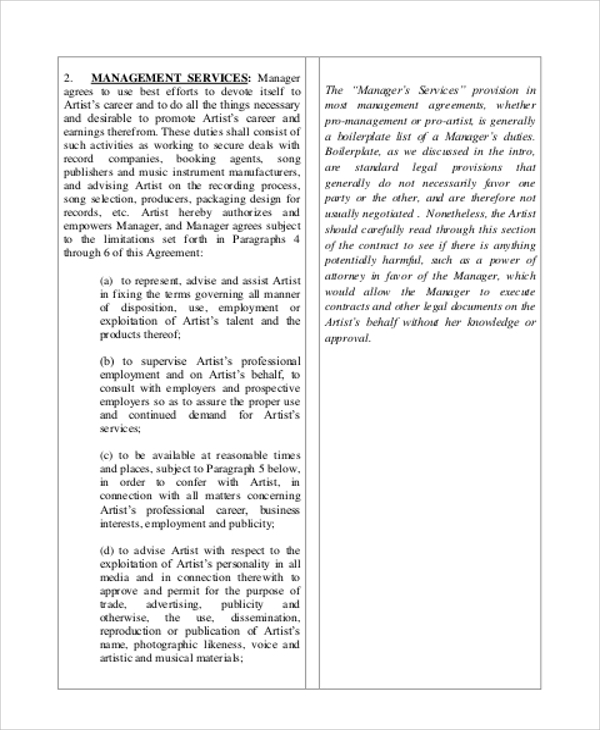 A music agreement contract may either be between an artist and a recording company or a band and its management. 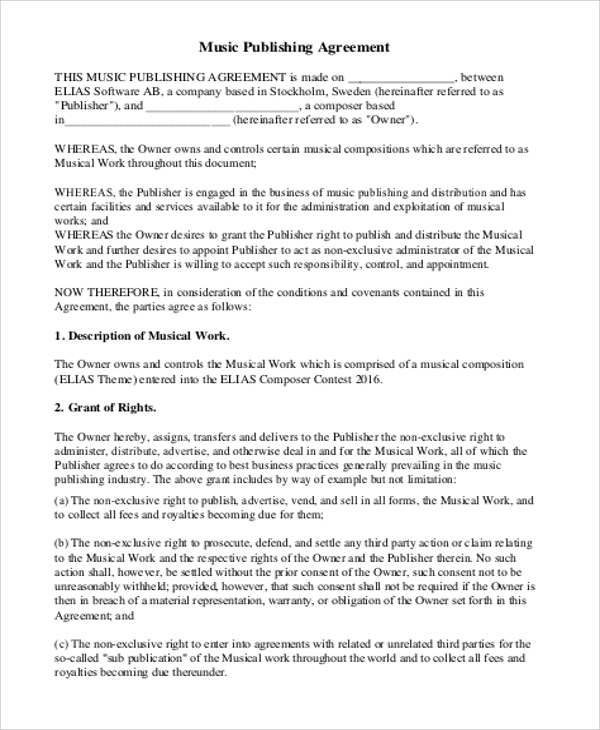 Whatever the collaboration is, the basic elements of a music agreement contract are the same with any artist collaboration that involves talent, its commercial benefits, and the percentage for everyone involved that need to cash in on the proceeds. 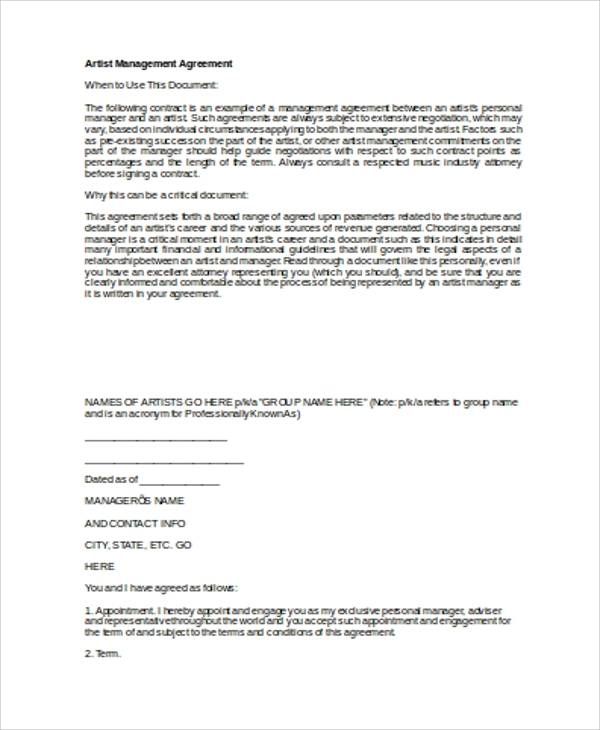 In its basic format and just like any other contracts, a music agreement contract is a document that is a legally binding agreement between representatives of a recording label and the artist or group. The artist involved is tasked with making the music while the recording label is tasked with selling the song or the album. Promotion of such songs may involve the artist to do mall tours and play select cuts of his music for free to entice the audience to buy or download the song for a fee. Radio stations may also be approached to promote the artist and the song plus a few playing gigs determined by the representatives of the music label to gain maximum impact on the audience share. 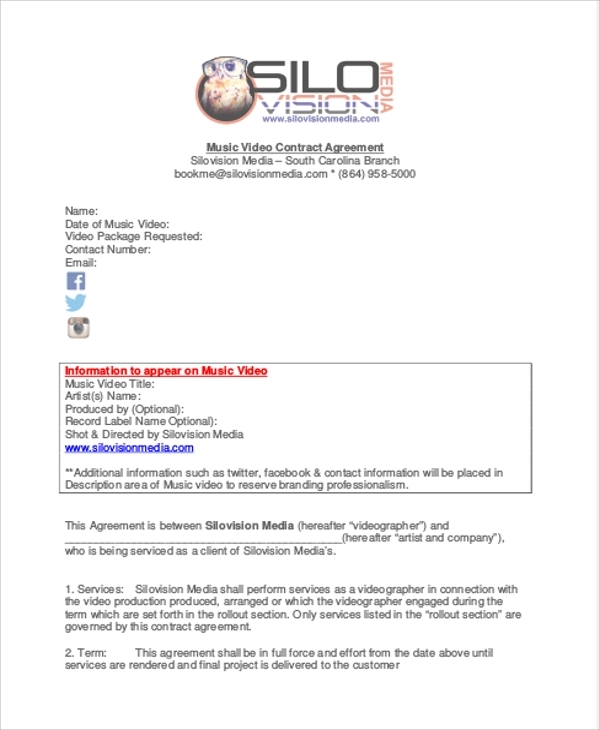 Artists under such contracts are bound to record only for that label exclusively. All other appearances and performances should carry the name of the label. In return for all kinds of promotion, the record company usually gets a percentage of all sales including merchandise that promote the artist. There have been a lot of instances wherein artists would have a falling out of their record labels and want to opt out of their contracts but cannot do anything since they are still bound by their contracts. For this reason, it is very important for an artist to carefully read the details of the contract in order to fully understand what he is entering into.For other kinds of contract agreements, please check more on our website or click on the links for examples of Sample Contract Agreements and Subcontractor Agreements that are all free to download for users who need to use these kinds of agreements. 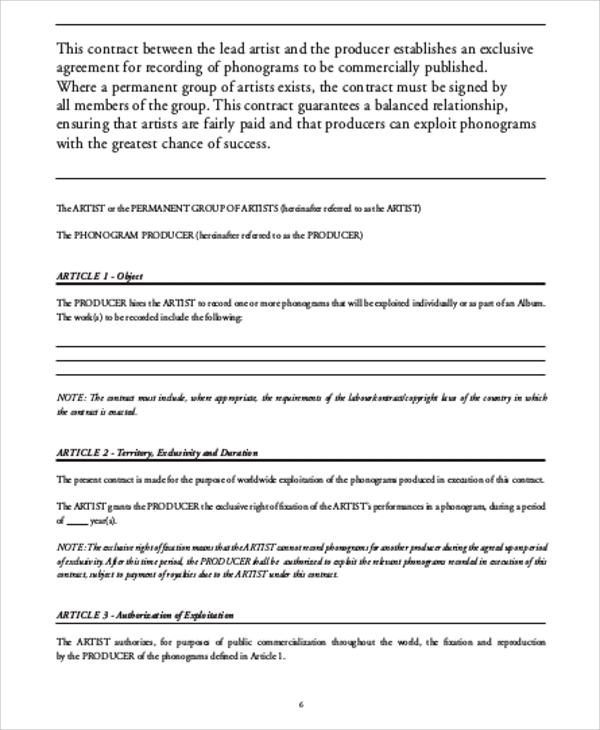 To prevent such otherwise avoidable instances from happening, our examples present the clearest view for artists who need to get a general idea of how contracts are being drafted, worded, and detailed so that when they enter into a real agreement themselves, they won’t be caught off guard and feel as if they’d been taken advantaged of by their record labels. Please check out more of our website’s samples such as Contractor Confidentiality Agreements that are needed by clients who need to draft such agreements to ensure secrecy of all information that are for company perusal only. These are all free for downloading and can be edited or modified to specifications before printing.